Recently i got to visit this beautiful temple. Pataleshwar cave temple of Pune, on the Jungli Maharaj Road, is a heritage site for Pune with a long history dating back to the 8th century AD. A remarkable feature of the Pataleshwar cave temple of Pune is that it bears resemblance with the massive rock-cut temples of Ellora. Pataleshwar cave temple is a huge temple carved out of a single rock and houses gigantic pillars, a shrine of Lord Shiva (also known as Pataleshwar) and a Nandi bull. 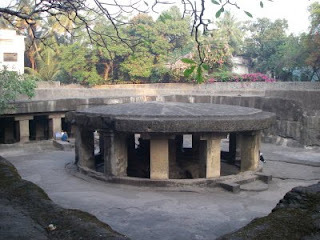 The Pataleshwar cave temple at Pune has an exotic arrangement of circular stone at the entrance. The entrance is a sight worth seeing, as it highlights acute sense of geometry of these architects. The temple also has a wide array of seating arrangement, including smaller rooms for the visitors. 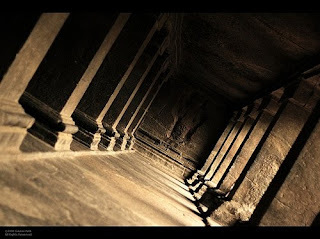 The sculpture of the Pataleshwar cave temple in Pune, which, although mesmerizing, is incomplete. Although we find an elaborate design in the main worship area, other parts of the rock temple is devoid of much beautification. The sculpture in the principle worship area include beautiful statues of Sita, Rama, Laxman and a host of other Hindu Gods and Goddesses located in the cube-shaped room at the heart of the temple. Temple looks well maintained too..Isn't? Nandu,good piece of information.If possible, if you have taken few more photos of this temple, please post few more pictures. Thanks Jnani. Unfortunately i dont have more photos of this..
so nice,far away from dis busy schedule na.